Last year I was all about lifetime games in customers' hands. This year I'm more interested in trends and developments. I'm going to look back over the past 3 years, see what I can see. As always, these are direct online orders only. No cons, no retail, no bundles, no Epimas, no nothing else. Lumpley games got 2007 direct online orders in 2013. Just about 900 of them were for Apocalypse World. Questions, comments, observations, interpretations, lines of inquiry? 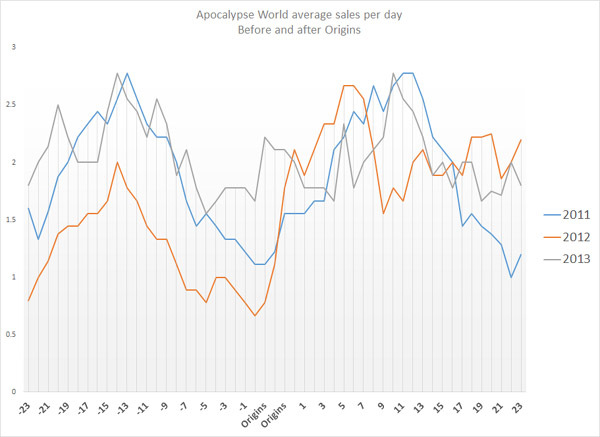 The gap in AW sales form an upward arc going into Q1 2013, then falling continually until the spike in Q4... that's curious! It's as if Q4 didn't get the memo about Q2 and Q3! Any thoughts as to why AW spiked so much in Q4 this year? Is this people coming back to the source from other Apocalypse engine games or what? Thanks for sharing here as well as the G+ stuff. Over on G+, I'm doing a series of "state of the biz" posts. Come by if you like, they're public. Part 4 is coming (and maybe more). Clayton: It's basically impossible to judge from quarterly numbers. For a quarter to spike like that, like 2013 Q4 or 2011 Q4, several smaller spikes, weekly or 2-weekly spikes, have to line up. 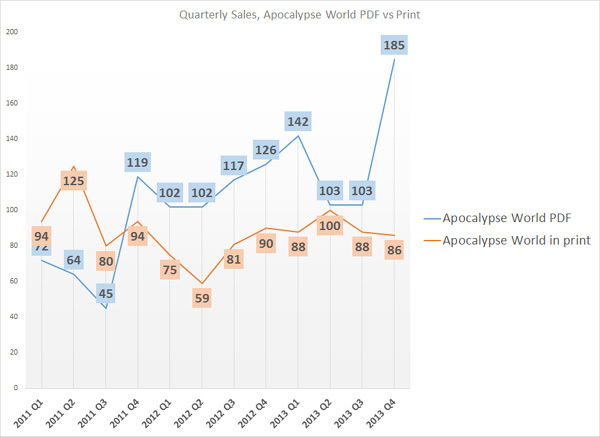 For instance, I can tell you that in December 2013 I got a startling number of Apocalypse World print orders, compared to October and November. Before December, print orders were in an even steeper decline than these charts show. My guess is that many of them were people who'd gotten the PDFs in the Bundle of Holding and who decided they wanted the physical book (but I'm seriously just guessing). Anyway, these account for a piece of the 2013 Q4 spike, but wouldn't be enough to create it on their own. There's no single thing I can point to. For me personally, I grabbed AW in q4 2013 as part of an indie games Bag of Holding. That bundle put Apocalypse World in a huge number of hands. What was it, almost 1,500? Kind of unreal. The Origins crew is super-stoked that we (think we) had an impact on your sales! Because not enough indie gamers come to our convention, despite it being objectively better than many others. Evan: I think you had an impact on my sales too. My theory is that con games' biggest effect is on con sales - that is, that when you run my games at GoD, you sell my games at our booth or at Jim's booth, so that's where you'll see the biggest impact - but still, the graph seems to point to yes! Pretty cool. Dungeon World had a similar print-spike around the same time. I think the Bundle-in-Print hypothesis might be accurate. I have a theory that the rise into near-ubiquity of at least one tablet computing device among any typical circle of middle-class nerds is partially responsible for renewed interest in PDF roleplaying books. Is the % increase in PDFs over a time a function of increased international shipping rates? More folks outside North America are ordering Lumpley PDFs than Lumpley books? Or is that a tiny drop in the bucket, and not really relevant? 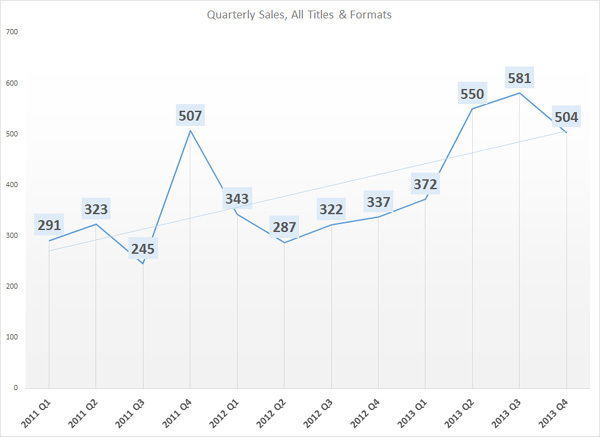 - Sales split 50/50 US/non-US overall, and pretty consistently by quarter. 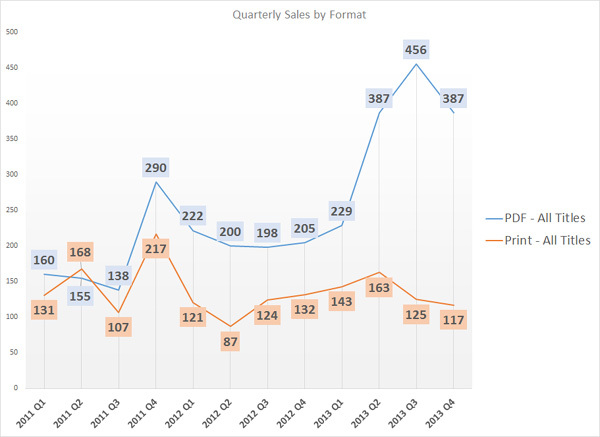 - Of US orders, PDF orders increased from 40% to 65%. - Of non-US orders, PDF orders increased from 65% to 85%. So, while international orders do account for a huge number of the PDFs I deliver, PDF orders are up versus print everywhere. So much for my theory! 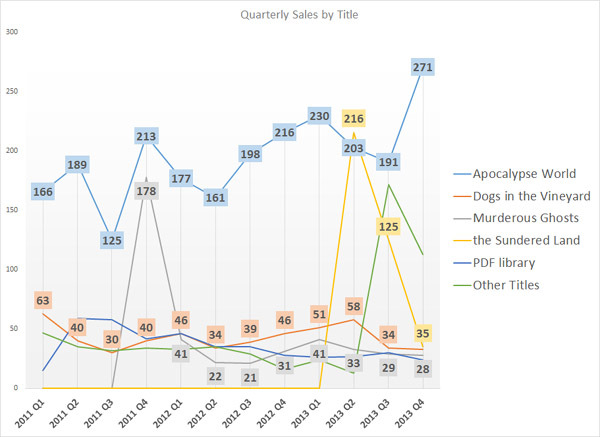 Do you have any theories on the increase in PDFs? Separately, I was under the impression that shipping individual orders overseas was cost-prohibitive. The FedEx website just told me it'd cost me $66 to ship a half-pound paperback to Oslo. I'm guessing your Norwegian customers don't want to pay $94 for AW. Have you found a service that's affordable for shipping from your city straight to a customer, or did you have to come up with some other approach? Shipping Apocalypse World to Oslo by USPS is $12, maybe $15.